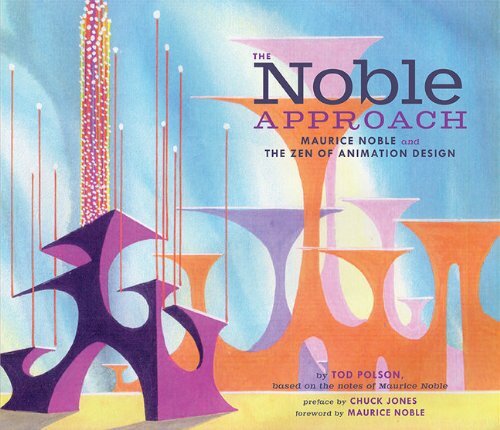 The Noble Approach is a book that's part biography and part animation design tips featuring the late great Maurice Noble. As a kid, I would watch the Warner Bros cartoons and never think about things like art and design. They are good which is why people watch them. Well, in this book, you'll go behind the scenes and look at the person who has a hand at creating some of these animated productions, and understand his design philosophies. Author Tod Polson who has apprenticed under Noble has done a good job with the biography detailing the designer's life and career right from the start. It's an inspiring tale of someone who has gone through a tumultuous period, with the need to support his family while still young, going through various career changes, having the ups and downs with co-workers, while still maintaining the passion to put out good design for animation and screen. The biography is about a third of the book. The rest are his philosophies on design. It's on how he handles story beats, story elements, using reference, contrast, simplifying elements, colour theory, perspective, layout, and more. The text and the illustrated examples are insightful. It's a collection of design principles he has learned and compiled over the 60 years he spent in the industry. It's a good book for those into animation and design, or into traditional animation design. Another related book I would recommend is Dream Worlds: Production Design for Animation from animation designer Hans Bacher.